Australian Dream reg; is for the temporary relief of minor aches and pains of muscles and joints associated with arthritis. nbsp; Australian Dream provides penetrating pain relief by increasing blood flow to the specific pain site. 1 list-style-type:disc 1 Odor Free Cream 2 Caspsaicin Free - Will Not Burn Your Skin 3 No Colored Dyes - Will Not Stain Clothing Australian Dream Arthritis Pain Relief Cream effectively relieves minor arthritis pain, simple backache, strains, sprains and bruises without the unpleasant qualities of many other pain relievers. nbsp; It causes no painful burning sensation, has no odor and does not leave a greasy feeling behind. nbsp; All you feel is soothing relief. For powerful topical pain relief, Australian Dream uses histamine dihydrochloride. nbsp; This active ingredient increases blood flow to the treated area, relieving arthritis pain the way your body does naturally. 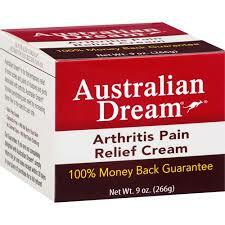 nbsp; Australian Dream is the ideal product to help treat your minor arthritis muscle and joint pain. Australian Dream is for the temporary relief of minor aches and pains of muscles and joints associated with arthritis. Australian Dream provides penetrating pain relief by increasing blood flow to the specific pain site. Odor free cream. Capsaicin free - will not burn your skin. No colored dyes - will not stain clothing. Australian Dream Arthritis Pain Relief Cream effectively relieves minor arthritis pain, simple backache, strains, sprains and bruises without the unpleasant qualities of many other pain relievers. Australian Dream reg is for the temporary relief of minor aches and pains of muscles and joints associated with arthritis. nbsp Australian Dream provides penetrating pain relief by increasing blood flow to the specific pain site. 1 list-style-type:disc 1 Odor Free Cream 2 Caspsaicin Free - Will Not Burn Your Skin 3 No Colored Dyes - Will Not Stain Clothing Australian Dream Arthritis Pain Relief Cream effectively relieves minor arthritis pain, simple backache, strains, sprains and bruises without the unpleasant qualities of many other pain relievers. nbsp It causes no painful burning sensation, has no odor and does not leave a greasy feeling behind. nbsp All you feel is soothing relief. For powerful topical pain relief, Australian Dream uses histamine dihydrochloride. nbsp This active ingredient increases blood flow to the treated area, relieving arthritis pain the way your body does naturally. nbsp Australian Dream is the ideal product to help treat your minor arthritis muscle and joint pain. Store between 40f And 86f (4C And 30c). Tamper Evident Feature: do not use if outer shrink wrap on jar is torn, broken or missing. Information on this site is provided for informational purposes only and is not meant to substitute for the advice provided by your own physician or other medical professional. You should not use the information contained herein for diagnosing or treating a health problem or disease, or prescribing any medication. You should read carefully all correct product packaging and follow the instructions. If you have or suspect that you have a medical problem, promptly contact your health care provider. Information and statements regarding dietary supplements and many other health conditions on this site have not been evaluated by the Food and Drug Administration and are not intended to diagnose, treat, cure, or prevent any disease and may be for commercial. Image shown for reference only. Actual item you recieve may differ from shown. The information contained in this page is intended for U.S. Customers only.Items listed on these website is just the listing and should not be considered as an advertisement or promotion of the products.